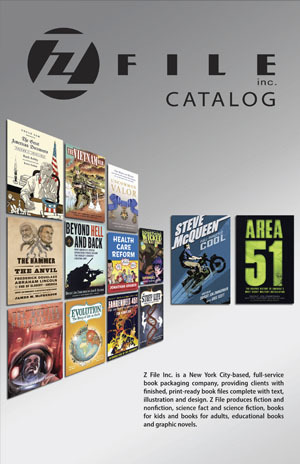 Z File Inc. is a full-service book packaging house that produces commissioned titles as well as proprietary, licensed material for publishers. Z File provides the necessary talent, including authors, illustrators and designers for completed printer-ready files. Recent successful titles include the public policy book and New York Times Best Seller: Health Care Reform, written by The Affordable Care Act (ACA) co-author Jonathan Gruber and illustrated by Xeric Award-Winning illustrator Nathan Schreiber. Also, The Hammer and the Anvil: Frederick Douglass, Abraham Lincoln, and the End of Slavery in America, a dramatized graphic history that follows the lives of two men who fought for the freedom of all Americans, written by Dwight Jon Zimmerman and illustrated by Wayne Vansant. AREA 51: The Graphic History of America’s Most Secret Military Installation, and the graphic biography of, STEVE McQUEEN: Full-throttle Cool. Z File has been part of the wave of nonfiction graphic titles that are causing libraries and bookstores to expand their shelf space and make room for more. Under exclusive licensing agreements with Ray Bradbury, Z File has brought to graphic life the literary classics Fahrenheit 451, Something Wicked This Way Comes, and The Martian Chronicles. Z File has also made science more accessible to the masses through its award-winning duo of natural science series of graphic novels: The Stuff of Life: A Graphic Guide to Genetics and DNA and Evolution: The Story of Life on Earth.